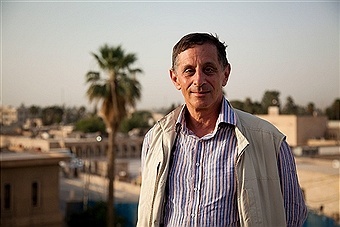 Former Reuters correspondent Roy Gutman (photo) has added to his many awards with a rare honour ranking him with figures from the world of diplomacy, politics and international law. The American Bar Association's Section on International Law named him as the recipient for its biennial Security and Peace Award. Named for the late Francis Shattuck, a renowned international lawyer, it honours "a person who has demonstrated creativity, initiative and courage in advancing security and peace in the many ongoing international conflicts." Past winners included former US Senator George Mitchell, ex-ambassador Christopher Hill, Judge Patricia Wald of The Hague Tribunal for the former Yugoslavia, former US State Department legal affairs advisor William Taft and Ambassador Lakhdar Brahimi, a UN special envoy. John Shattuck, former assistant secretary of state for human rights and son of the award’s founder, made the presentation in Chicago at the ABA’s convention last week. He said Gutman "is recognised for his lifetime achievement as a journalist, whose courageous and honest reporting of deadly conflicts has made a significant contribution to security and peace." "At a time when international law is under attack by nationalist politicians all over the world, Roy’s commitment to telling the truth about crimes against humanity has shown the power of an honest journalist… In a world that is desperately in need of truth-telling journalists to advance the cause of security and peace, Roy, you are one of the best practitioners in your embattled profession."